Here are some top tips for photographing the coast out of season. This time of year can be an ideal time to shoot at the coast as although it's cold, and you'll need to wrap up warm, it provides a great opportunity to shoot at the beach without having loads of tourists and holiday makers in the shot. Compose the image carefully - Think carefully about what you're including in the image, and be sure to cut out any distracting features that take away from the main focus of the image This might mean moving the camera slightly, or physically removing the offending object, if it is seaweed, for example. Consider portrait landscapes - Just because you are shooting a landscape view, doesn't mean you have to shoot in landscape format. Sometimes, using the portrait format for a landscape can help to lead the eye through the image better, especially if there is interest at the front of the image as well as at the back, for example an interesting looking rock covered in limpets. Foreground interest helps - Having something of interest in the foreground as well as the background can help to add depth to the image. Use a small aperture to get front to back sharpness, and you can use foreground objects, when composed properly, to lead the eye up to the main background interest. Take a different angle - Think about all the different angles you could shoot the same scene from, and choose the one that look s best to you. By moving around and exploring before you settle on an angle, you'll make sure all the bases have been covered and you've got the ideal one for the shot you're after. Filters - Filters are great for balancing out the brightness in shots. 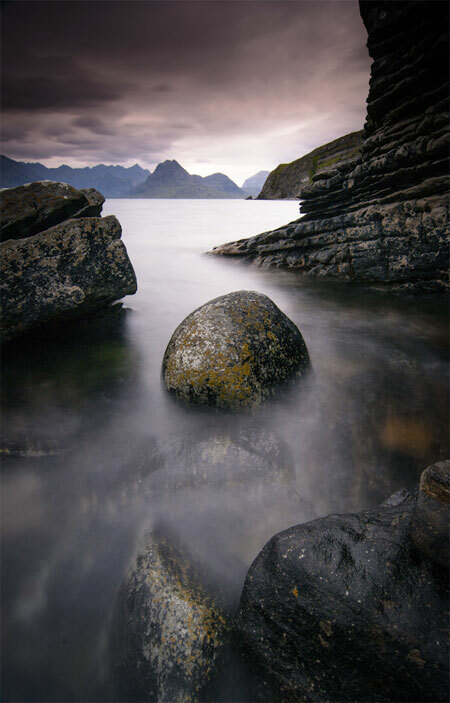 Use an ND graduated filter to add mood to a cloudy sky, and balance out the exposure of the image. A polarising filter can be used to eliminate glare and reflections from water is necessary, too. Choose the right lens - You can go for the traditional wide angle if you want to fit a lot of the view in the one shot, but a telephoto lens has its merits, too, for detailed foreground interest. A telephoto will work for a portrait landscape shot, too. Use a tripod - A tripod will enable you to shoot at slower shutter speeds without getting a blurry image, plus it will enable you to set the camera up and position it perfectly for the shot, leaving you free to move around. A shutter release will also be ideal for longer exposures when you don't want to cause shake by pressing the shutter. wow, nice picture. to get a good picture should be smart to get an interesting moment. i'm content writer about health, for website klinik utama gracia. I am an artist and photographer. I love to use Photoshop for editing my photos and this post is very informative for me which is about top tips for Photographing at the coast. You have a great experience in photography which you shared here with us. Thanks for share this post here and i think it is good to have this post here and i was wondering for this awesome post.You did such a great job and i was taking a look on this post and then in found something new on this wonderful post. I am an artist and photographer. I love to use Photoshop for editing my photos and this post is very informative for me which is about top tips for photographing. You have a great experience in photography which you shared here with us. Facebook Customer Service is all time available for Facebook users. If you are facing technical issues with facebook then call Facebook Support Number +1-800-304-9126. Looking for AOL Customer Service without any delay or waiting then call AOL Support Phone Number or you can visit our Website for Live Chat Support. Are you tensed because of your Facebook technical issues? Do not need to worry about Facebook problems. You just need to contact Facebook Customer Service to get an instant support through online remote service. So, Dial now Facebook Support Phone Number or you can also get Live Chat Support by visiting our Website. Quicken technical support administrations are accessible at Quicken Toll-Free number to help every one of the clients of this bookkeeping apparatus. If you need any help regarding facebook account then connect our facebook Customer Service by dialing Facebook Phone Number +1-800-304-9126. If you are Facebook users last few years but suddenly face some technical error then you can dial Facebook support phone number and get instant help. HP is the best service provider which is famous across the world. If you face any technical error on your HP devices, then contact to HP customer service number and get instant help. We provide the best customer service to our Dell laptop users our technical expert team is available 24*7 to serve customers. You can call our AOL Technical Support Phone Number who is helping you communicate with well-trained technicians and discuss your AOL related problems. We will always available for the solution. If you face any kind of technical error while using the HP laptop, just use HP laptop help number and get instant help. HP expert is available all the time for the users. Hp expert can resolve any kind of technical error such as HP laptop blue screen error. In case you face any technical error just dial outlook customer service number and get instant help. Yahoo is the best web portal and nowadays most of the users are using the Yahoo email account. So if you face any kind of technical error in Yahoo email account then dial yahoo customer service number and get instant help. AOL provides the best webmail services and it becomes a no 1 email platform. So, in case, you need some technical assistance then dial AOL customer service number and get instant help. Now travelers across the globe can fly a relaxing flight with american airlines. The bookings for this airline can be easily made at american airlines reservations. Passengers can also avail some great benefits on the bookings made at this helpline, open 24/7.